Baltimore police are investigating the apparent vandalism of the city’s Francis Scott Key Monument on Eutaw Place in Bolton Hill. Police were called to the monument at the intersection of Eutaw Place and West Lanvale Street at around 6:30 a.m. Wednesday. 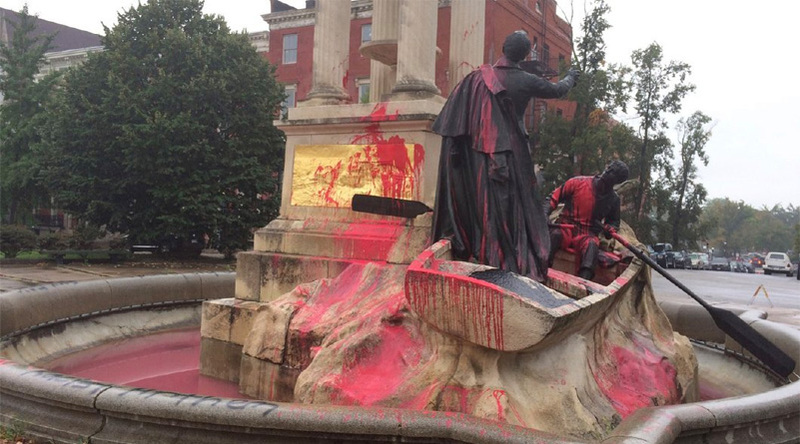 The monument was defaced with red and pink paint, and the phrase “racist anthem” was sprayed at the monument’s base. Police are reviewing surveillance footage from buildings around the monument in hoping to find a suspect. Key, who owned slaves, was inspired to write his verses by the Battle of Fort McHenry on Sept. 13-14, 1814 during the War of 1812. The seldom-sung third verse says: “No refuge could save the hireling and slave from the terror of flight or the gloom of the grave.” Many believe it refers to slaves who fought for the British. This vandalism is reported three weeks after the Christopher Columbus statue in Baltimore City was vandalized, with the suspected vandal posting a video on You Tube. That incident is under investigation. Baltimore is truly City of the Apes.